The construction of a new £7.5 million dementia specialist care home in Warwick has officially started. Last Friday (April 27) a ground-breaking ceremony was held to mark the construction for the new state-of-the-art care home in Spinney Hill. Residents, staff, and guests – including Warwick Mayor Stephen Cross and Cllr Richard Edgington – attended the event at the site, which will become a village-style facility for 72 older people and people with dementia. The care home, which will be operated by WCS Care, will replace the former Woodside care home, which closed for demolition in 2017. Due to open in summer 2019, the new home has been designed by Warwick-based architects Robothams and will be built by Deeley Construction. 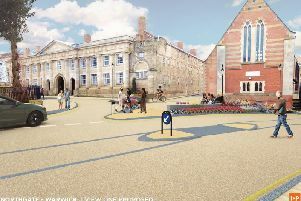 It is also being built with support from a £5.9 million funding deal from the Royal Bank of Scotland. In the coming months a name will be chosen for the home. WCS Care currently operates 11 care homes across Warwickshire including in Kenilworth, Rugby and Leamington. Former Woodside residents like 90-year-old Val Hase are living at another of WCS Care’s homes, Castle Brook, in Kenilworth, while construction takes place. The new home will include family-scale households for up to seven people, with ensuite facilities as well as a spa, cinema, salon, shop, café, and launderette. Once work is complete the facility will feature the latest technology including circadian rhythm lighting and night-time acoustic monitoring. There will also be smart phone apps connected to mobile care monitoring, where people can check on their loved one’s care 24-hours a day. Kenny Nelson, relationship director at Royal Bank of Scotland, said: “The plans for WCS Care’s new home are very impressive and I am pleased that we are able to support the creation of such a vital new facility.